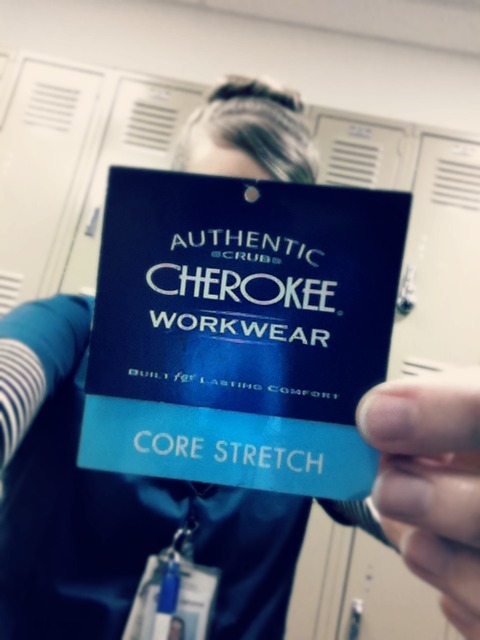 Before this, I only had one pair of Cherokee scrubs, the workwear core stretch ones. Now I’m adding one of their new Cherokee Flexibles tops to the collection! I like this top. Quite a bit. It’s true to size (mine is XS) and for a girl with a long-ish torso, the top is a perfect length and I feel totally comfortable wearing it. The material is soft and the side panels are stretchy (made from a poly/spandex material) and makes the top fit in a more flattering way. I’ve worn this top 3 times in the last 2 weeks and it’s going to hold up in the wash like a champ, I can tell. Very, very comfortable. See those buttons on the pockets? They snap the pockets CLOSED. For “added security,” apparently. Listen, I’m not spending my whole 12-hour shift snapping and unsnapping my pockets to get my pen/scissors/alcohol wipes/brain out. And I can’t simply leave them undone because it looks weird to show the round metal disc on the front, sticking out like a sore thumb. So I did a little DIY project on my scrubs. For someone who isn’t crafty, I’m pretty proud of it! First, with the snap flap closed, I took some scissors and cut the flap free. With a little free-hand stitching, I sewed the top part of the flap to of the pocket. Then, using my seam-ripper, I turned my scrubs inside out and got rid of the leftover bit of fabric that was still attached where I cut the flap off. That’s it! Now, if you like the idea of your pockets snapping closed, then you don’t have to do a thing when you buy this top! So. My plan is to swap this with my old navy top. I’ve worn it so much, it’s starting to fray at the neckline where I attach my name badge. And here’s a little something for you readers! A 15% off coupon code for their website! ps. Looking back through these pictures makes me realize that this post makes me look like I have a lot of blue and grey in my life. 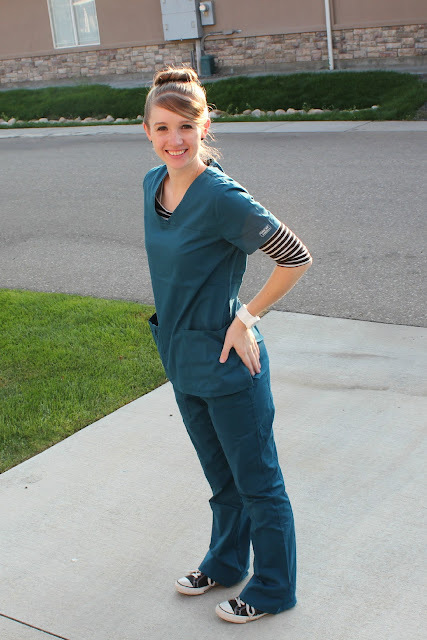 Have you noticed a general color scheme in your scrub wardrobe? Or do you work at one of those places that have a color dress code? Follow Uniformed Scrubs on your preferred social media source. That way, you’ll hear about all their great deals when they happen! After nearly 5 years of wearing scrubs, it could be said that I have some favorites. 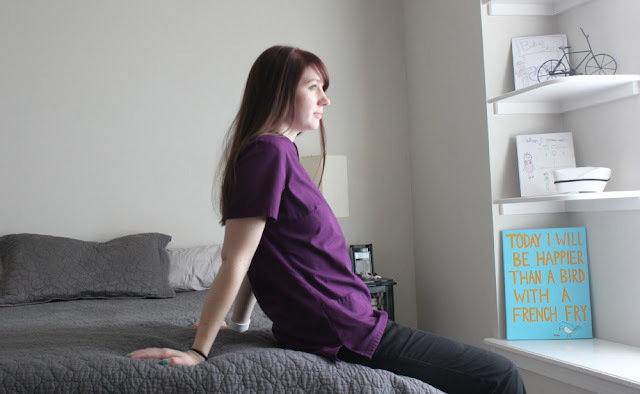 Here on the blog, I’ve talked about Dansko scrubs, Cherokee scrubs, and my purple Dickies scrub top, to name a few. 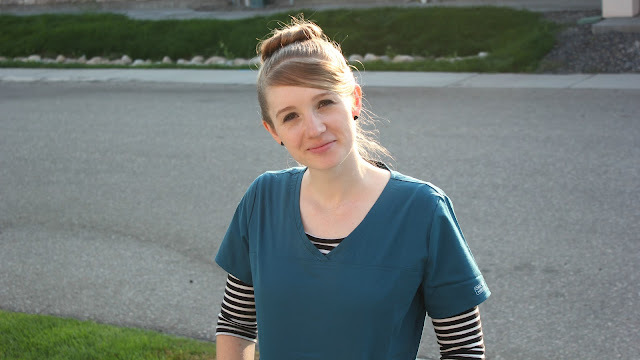 I was recently given the opportunity from Medical Scrubs Collection to try out a brand of scrubs that was completely new to me. Or maybe you’ve heard of Smitten? Before this, I hadn’t. The website says, “Designed for the hip, young nurse or medical professional, Smitten medical uniforms are designed with fashion forward style and detail.” This sums it up nicely. My previous pair of navy scrubs were getting so well worn that the infamous crotch split was bound to happen any day now, so the fact that they carry mostly grays, blues, and blacks (with a few pinks scattered in) didn’t bother me at all. I originally ordered the pants size small, regular length and they drowned me. I’m 5’6” with a long torso and short legs. This gave me a chance to use their returns/exchange service and all it took was filling out one form, mailing them back, and my new pants showed up at my door. Simple and easy. This is the first time I’ve ordered petite pants over the regular ones but, for these particular pants, they work so much better. 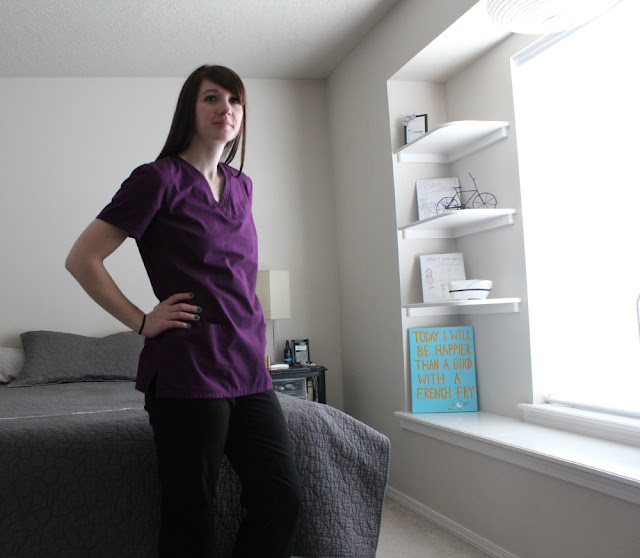 Smitten scrubs have the these amazing deep pockets and great fabric, with a grey’s anatomy type of softness to it. And the details are what I love about these scrubs. The pink stitching and logo add the perfect amount of feminine touch without being too girly. I know a lot of my nursing friends out there are required to wear a certain color for the unit they work in. My hospital hasn’t converted over to that (yet) but this would be a great option if you want a little pop of color while still complying with your dress code. Just saying. The one thing I’d change about these scrubs is the drawstring part of the pants. It’s the kind you have to tighten and hold with one finger while trying to tie a bow with the other hand… not the most user-friendly. But manageable. It’s not stopping me from wearing them, that’s for sure. I think it’s safe to say that I can add Smitten to the list of favorites. Check out Medical Scrubs Collection for end of the season deals and reduced prices on awesome scrubs! And if you’re looking for other brands, this website has them all! I actually have my eye on this top (in all its star treky glory) and this one (those notches on the neckline are a nice detail I haven’t seen before)! A little while ago, Uniformed Scrubs contacted me to see if I’d be interested in reviewing one of their pieces from the Dickies spring/summer line. Being the indecisive person that I am, it was at least a week before I finally settled on one! I chose the v-neck scrub top in eggplant, size small. I probably could have gotten away with an XS if I wanted a more fitted look. Compared to other scrub brands, I’d say Dickies run a bit on the large size but just keep an eye on their fit chart, it’s pretty accurate! My favorite thing about this top is how long it is. Long enough that you can’t even see the t-shirt I’m wearing underneath it. I typically wear some kind of undershirt, especially with shorter scrub tops I own- we nurses do a lot of bending, you see. And the pockets! 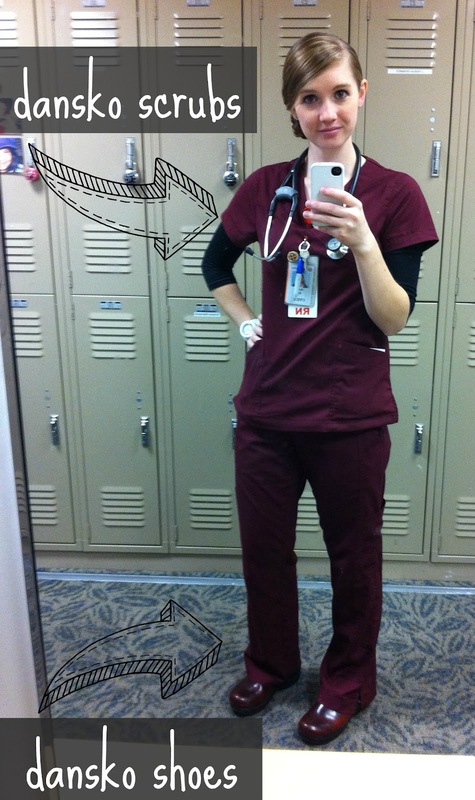 I used to have a purple scrub top with side pockets and they sort of drove me crazy. I prefer to have the big front pockets to carry all my nursing goodies in. Overall, I’m happy to add this top into my collection. Perfect timing, with Nurse’s Week coming up. Treat yourself to some new scrubs, you deserve it! ALSO. 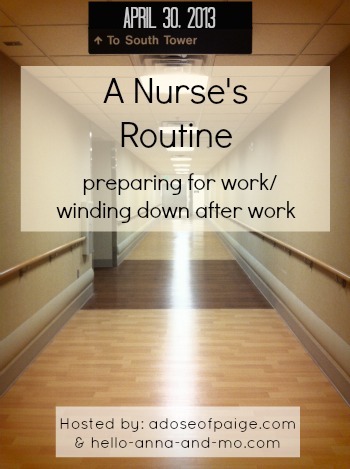 Next Tuesday is your chance to link up with Paige and I and talk about nursing stuff! Tell us what your routine is like. What do you do to get ready for work physically/mentally? 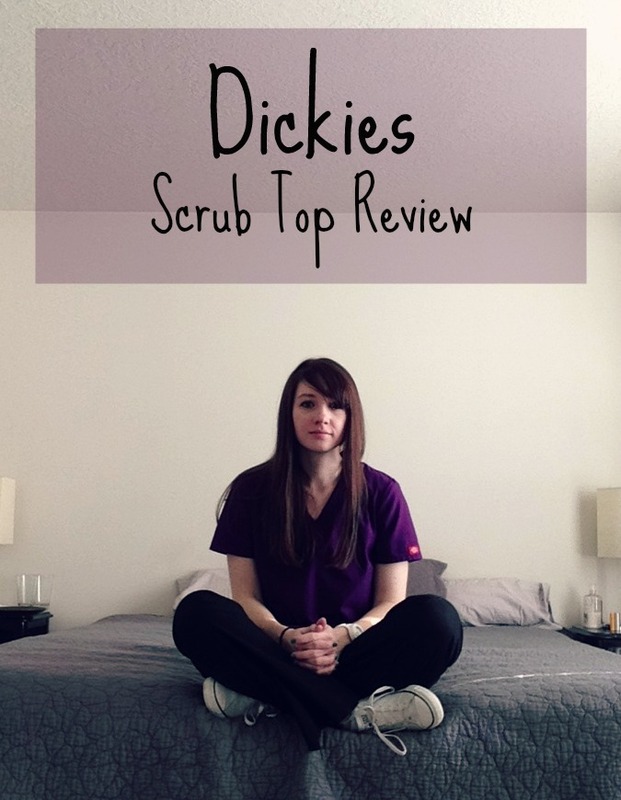 Scrubs Review and A GIVEAWAY. Everyone knows Dansko for their shoes. They’re quite famous for them, actually. A good pair of shoes is as important as a good stethoscope. And a good stethoscope is as important as a good set of scrubs. 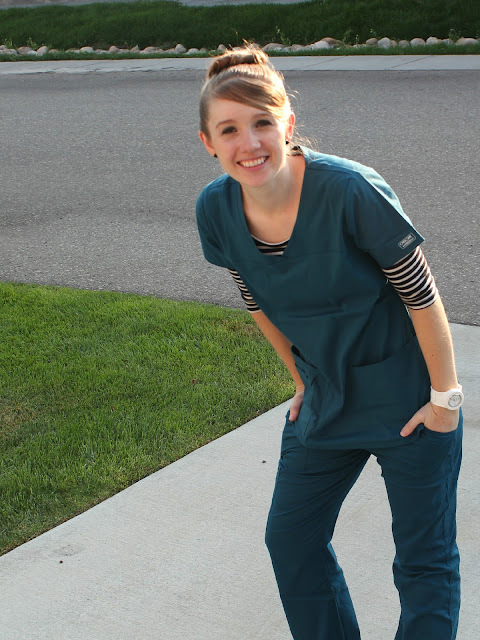 A few weeks ago, I was contacted by Dansko to see if I would review a set of their new scrubs for Fall ’12! and by the looks of it, I think they’ve made some scrubs that will prove to be every bit as fabulous as their shoes. My first impression as I pulled them out of the box was “wow, this fabric is heavy!” In a “this is good-quality” kind of way. I could instantly tell the difference between them and my other scrubs, just by the feel of the cloth. And they fit amazingly well. I chose this top and these pants (size: xs, color: wine). Another thing I love about these scrubs is the attention to detail. Look at all the pretty seams and embroidered ‘dankso’ on the pocket! Speaking of pockets, I think it’s a well established fact that I LOVE me some pockets. As a nurse, you can never have too many. These scrubs come well equipped in the pocket department. I’ve worn this pair of scrubs twice already, and I’ve only had them for a week! They also have a HUGE selection of colors to pick from. It took several days and a consultation with Mo to finally decide on a color and style. Thank you Dansko, I’m in love. Dansko is going to give away a pair of scrubs to a reader! and you don’t have to be a nurse to enter. Seriously, scrubs are the best thing in the world. They make excellent pj’s or you could give them as a gift…or you could find a way to use them, with Halloween coming and all. And they have scrubs for men too! so many options. The instructions are in the rafflecopter thingy, but all you need to do is check out their website HERE and tell me what what style/color of scrubs you would want! I had the hardest time choosing, I’m curious what you guys will pick! ps. you know what’s ALSO next week? a nurse linkup. Join Renee and I and share a story (or stories) of the time your patient fell or nearly fell! 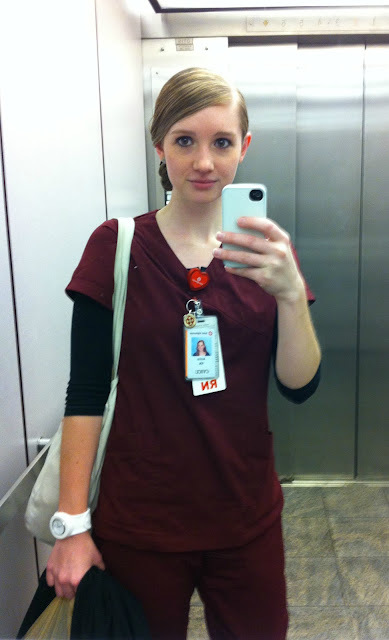 Nursing Tuesday: Scrubs Review and Q&A Questions! A couple weeks ago, I was contacted by the people at medicalscrubscollection.com and was asked to review of pair of their new Cherokee Workwear Stretch scrubs. I was happy to oblige, seeing how I wear scrubs 3 or more days a week. A nurse can never have too many pairs of scrubs. I’ve actually grown quite fond of them over the years. I feel for people who have to wear heels or ties to work. You poor souls. The hospital lighting in these pictures makes these scrubs look so much bluer than they actually are but you’ll get the idea. PROS: First of all, may I just say, COMFY? They are the epitome of this nursing confession on pinterest. The material has a bit of a stretch to it, which I’m pretty sure is their secret ingredient. This top has pockets galore, which I love since I don’t carry a nurse fanny pack or utility belt (you know the ones I’m talking about). And speaking of pockets, the pants have more! I am so comfortable in these scrubs. CONS: The sizes run a little big (I’m in their xsmall). But who wants to spend 12 hours in tight scrubs, anyway? And if you’re 5’6” like me, consider their petite pants! Mine are a touch long, but that’s ok. I kinda like them that way (don’t you worry tall friends, they also make pants for you). THIS is a more accurate representation of the color. Also, check out their Facebook page, they have a labor day promotion coming up. ready to get your brain juices flowing? here are the questions Renee and I will be using for the Q&A link-up next week! Nurses and nursing students, please join us!! 1. Where do you see yourself and your nursing practice in 10 years? 4. If you could warn your patients to avoid one thing from the hospital menu, what would it be? 5. Do you have a nurse idol? If so, who and why? 6. If you could push one piece of medical equipment out the window, which one would it be? 9. What advice would you give to someone who is considering the nursing profession? 10. If you hadn’t become a nurse, what would you have done? Alrighty ladies! That’s it. I’m excited to hear answers next week!